Home / Blog / WHY DO WE EAT PANCAKES ON PANCAKE DAY? Pancake Day, or Shrove Tuesday, is on 13 February in 2018. But why do we eat pancakes on pancake day? The Monday and Tuesday before Lent were periods of great festivity before the coming days of abstinence. Children would go ‘Shroving’ or ‘Lent-crocking’ on Shrove Tuesday (or the night before), knocking on their neighbours’ doors and singing. 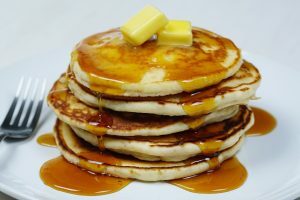 Like Easter, Shrove Tuesday – now better known as Pancake Day – occurs on a different date each year because it is calculated by the cycles of the moon. This year it falls on 13 February.